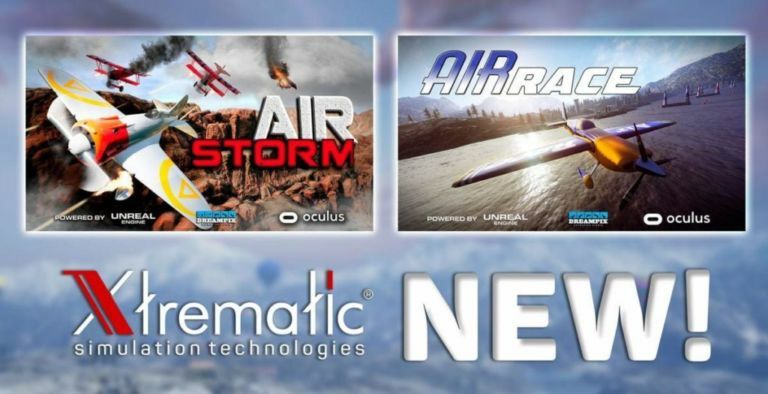 We have great news for all fans of planes and flight simulators! Dreampix studio released two games where you can be in the place of a true pilot and navigate a racing plane or a battle plane! Forget about calm and relaxing flights on airliners! Air holes, tight turns and loops are waiting for you in our VR flight simulators! If you wanna chill out and enjoy swooping down among the chain of mountains try our new movie Air Race! The scene is laid in the Alps so you will fly over the snow-capped mountain tops on the airplane simulator! Our studio created this ride especially for RedBull Air race, world championship held by The World Air Sports Federation. This race is entered by highly experienced pilots who compete in control of the lightweight racing airplanes. These airplanes accelerate to the speed of 370 km/h and pilots get G stress while flying above the track marked with inflatable 25 meters high pylons. Air Race location imitates a real RedBull race way including pylons and low altitude flights. Such flights are really breathtaking! Wanna have more extreme and interactive flights? You’ve always dreamed to become an air force officer? Air Storm ride takes place above the scenic canyon where you not only can fly on a fighter plane using VR machine but also shoot hostile aircrafts! Put a target on planes and huge rigid airships and watch them exploding! Air Storm is a multiplayer game so you can battle in the sky with a real enemy and also talk to him because our virtual reality simulator supports audio connection between users!